On Tuesday night, we went to an election party. We were ready to celebrate - the refrigerator was stocked with champagne, pizzas were delivered, many people brought their children to see what we were certain would be a historic moment. There may or may not have been a piñata of a certain presidential candidate's head, filled with leftover Halloween candy and airplane bottles of liquor. We were happy. We were hopeful. We were ready. As the night wore on, however, the crowd began to thin. Our boisterous mood turned quiet, our conversations stunned silent. Those who stayed sat in chairs, staring at the television and their phones, searching for an alternate story, the one with the ending we all deserved. Nathan and I finally left around midnight, and it felt like the world had been turned into a pumpkin - party over. When I went to bed, I was still hopeful. When I woke at 3:30AM and checked my phone, I finally accepted that it was over. I lay in bed for over an hour, staring at the ceiling, numb. On Friday morning, I woke up and could barely walk. This has happened before. It starts in my pelvis, with my sacroiliac joint, and radiates out through my hips and lower back. Most of the time I keep the pain at bay with yoga, but sometimes it flares up unexpectedly, making it difficult to walk and impossible to sit upright. The sitting thing is particularly inconvenient, since my job depends upon my ability to be at my desk. I went to work anyway but only lasted 45 minutes before I had to leave and go straight to a chiropractor. It was my first time at this particular practice and ended up being a consultation, mostly - questions rather than relief. "Have you experienced any unusual stress this week?" the doctor asked, glancing up from his clipboard. "Just the election," I said. He laughed as if I were joking. I spent the rest of that day at home, on my back, trying to ignore the pain radiating through my lower body. I only go to the chiropractor when I'm really desperate - deep down, I'm skeptical of their beliefs, the almost religious way they believe that our emotional and physical selves are so closely linked - but as I lay there, I started to believe. My emotional state - sadness, frustration, confusion, disbelief, fear, disappointment, heartbreak - had become my physical one. 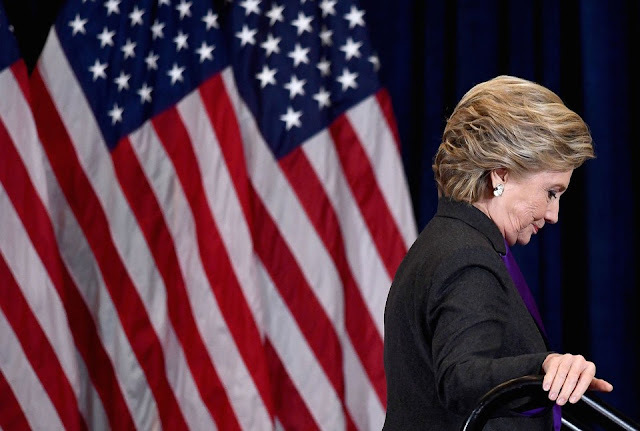 On Wednesday morning, when the election results had crystallized, I felt as if I'd been knocked down. On Friday morning, I couldn't stand up. It's hard to believe this was purely coincidence. I've spent a lot of time since Tuesday thinking about what I can do, and I keep returning to my community here in North Carolina. We were considered a swing state, and while Trump won the top of the ticket, we did manage to elect a new Democratic governor. North Carolina is a complicated place with a dark history and - I believe - a bright future. I want to be a part of the brightness. I'm going to spend a few weeks researching and reaching out to local organizations, seeing where my skills and talents could be put to the best use. I'm talking to other people in my community who are also feeling rage and sadness and disappointment, who refuse to accept this election as an ending. In her beautiful concession speech, Hillary Clinton said "This loss hurts. But please, please never stop believing that fighting for what’s right is worth it. It’s always worth it. And we need you keep up these fights now and for the rest of your lives." Next week, when Roy Cooper is officially our governor (they're still counting the final ballots but I am, still and always, hopeful) we'll drink the champagne we never uncorked. After a weekend of rest, my body will realign itself and the pain will recede. I will get up and I will fight, now and for the rest of my life. This isn't an ending. It's a beginning, and I'm ready to work.